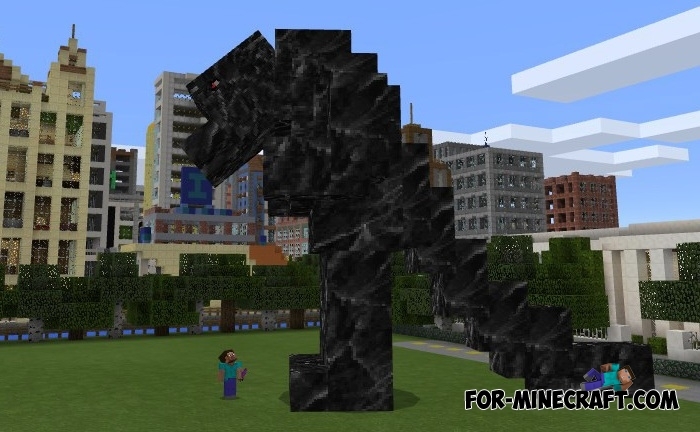 Do you think the dragon is the most powerful mob in Minecraft PE 1.0.0? Now it is not so. Meet the huge Godzilla, destroying everything in its path. You are just a spot for it, because the Godzilla 14 times higher than you. And that's not all, the Godzilla stronger than the Ender dragon twice and uses fireballs. To defeat him you need to take all of the most useful and good concentrate before the fight. It is enough to build a structure to summon a golem. Hit it and then you have to run very fast, preferably underground. This giant creature is so large, that if you come close to him you will not see his head. The King is the new mob that was added along with Godzilla. Go to the nether, where you will find them in large numbers. Download the Dyltroit city for MCPE and arrange a real battle for saving mankind. Chances to win are pretty small, but if you happen to win then you will get an iron ingot and a flower in the end. How to install the Godzilla mod?